Konica Minolta bizhub C35, C35P - ONLY ! Type: Toner Chip. #1 - PICK UP. Color: B, C, M, Y. Part No. : A0X5432, TNP22C Cyan. Part No. : A0X5132, TNP22K Black. " Part numbers must be matched " !! ImageCLASS MF8280Cw, i-SENSYS MF8280Cw. Part #: 131. Color: B, C, M, Y. Color - Up to 1,500 pages @ 5% Coverage. Compatible Printer Models. LaserJet P2035, P2035n, P2050, P2055, P2055d, P2055dn, P2055x. Part No. : CE505A CE505X. Included:4 Toner Reset Chip. Type: Reset Chip (Non-OEM). Color: Black. Or Q3960A ,Q3961A,Q3962A,Q3963A. HP Color LaserJet 1500 2500 2550L 2820 2840 MFP. 100% compatible and. All major credit card accepted. Work with : Samsung CLX-3300, CLX-3305, CLX-3305FN, CLX-3305FW, CLX-3305W, SL-C460FW, Xpress C460FW, Xpress C460W CLP-360, CLP-365, CLP-365W, SL-C410W, Xpress C410FW, Xpress C410W. 1- Yellow toner reset chip. 2 x Reset Chip(USA Version). 1 x Reset Chip (H516C). For Printer Models. Dell B1160, B1160w B1163w, B1165nfw MFP. Part No. : YK1PM (HF44N). Included: 1Toner Reset Chip. Type: Toner Chip. Included: 1 Toner Reset Chip. Color: Black. Part #: ML-D2850B, MLD2820B. ML-2850, ML-2850D, ML-2851ND. 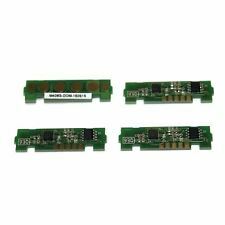 Compatible with printers : Samsung CLX-3185N/3185FN/3185, Samsung CLP-325/320N/320, Samsung CLP-310/310N/CLP-315/315W, Samsung CLX-3170FN/CLX-3175/3175N/3175FN/ 3175FW, CLP-360/365/365w, Samsung CLX-3300/3305/SL-C460W, Samsung Xpress SL-C430 /C430w/ C480 /C480w/C480FW. 2335n, 2335dn series. 2 x R eset Chip. For Printer Models. Trending at $6.08eBay determines this price through a machine learned model of the product's sale prices within the last 90 days. 1 x USA Reset Chip. For Printer Models. CM1312 MFP, CM1312nfi, CM1312nfi MFP, CP1215, CP1515n, CP1518ni. 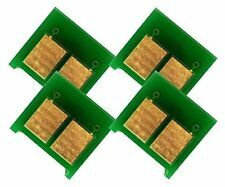 4 x Toner Reset Chip for HP 305A (CE410A) CE 411A CE412A CE413A LaserJet Pro 300 M351, 400 M451. Work with: Xerox Phaser 6500, Workcentre 6505. Page Yield: Up to 3000 pages for black, 2500 for each color. B1260 B1260dn B1265dnf. 1 x Toner Reset Chip. For Printer Models. Pictured is actual item. Work with: Konica Minolta Magicolor 4650 4650EN 4695MF 4650DN 4690MF. 1 x Cyan Toner Chip @ approximate yield of 8,000 pages. Color: Cyan. Item condition: New. LaserJet P3010, P3015, P3016. Part #: CE255A, CE255X. Included: Toner Reset Chipx 4. Color: Black. All-in-One Enterprise M525dn MFP, M525f MFP. TYPE: NON-OEM. Work for: HP Color LaserJet CP1025nw, 100 MFP M175nw. Compatible part #: CE310A, CE311A, CE312A, CE313A. ( 1 for each color). Color: Y,M,C,K. Part #: C9730A, C9731A, C9733A, C9732A. LaserJet 5500, 5550 Series. Color: B, C, M, Y. Compatible Printer Models. Work with: Ricoh AFICIO SP C250DN, C250SF, also fits Savin, Gestetner, Lanier series color laser printer. Color: Yellow. Item condition: New. For International out side USA. Ricoh Aficio SP C431DN. Gestetner SP C431DN. Ricoh Aficio SP C430DN. Gestetner SP C430DN. #1 - PICK UP or Combine. with your other order - FREE. For Dell 1710 1710N series. Do-it-yourself Toner Refill kits with Reset Chip. 1 - HY reset chip(6000 pages ). 1 - bottle black toner refills. 1 - set illustrated instructions. Work with: MINOLTA BIZHUB C452 C552 C652. Product Type: Toner reset chip. Color: Black. Made in: United States. Item weight: 1 oz. Compatible part #: TN613K-chip. Work with Xerox Phaser 7760, 7760DN, 7760DX, 7760GX. Compatible part 108R00713. If (before you replace the chip) your Drum is already printing with streaks, smudges or lines, the drum is basically already defective or exhibiting signs of defect, and replacing the chip it will not bring it back to life. Compatible part #: NF556. Work with: Dell 3110, 3110CN, 3115, 3115CN. 1 x Reset Chip. Color: Yellow. 1 Magenta chip. 1 Black chip. 1 Yellow chip. 1 Cyan chip. For International out side USA. Work with: Dell 3110, 3110CN, 3115, 3115CN. Color: Cyan. 1 x Reset Chip. Work with: MINOLTA BIZHUB C452 C552 C652. Product Type: Toner reset chip. Color: Cyan. Made in: United States. Item weight: 1 oz. Compatible part #: TN613C-chip. Work with: Xerox Phaser 6500, Workcentre 6505. Part No. : CF226X (26X). HP LaserJet Pro M402n. HP LaserJet Pro M402dn. HP LaserJet Pro M402dw. HP LaserJet Pro M426fdn. HP LaserJet Pro M426fdw. #1 - PICK UP or Combine. Compatible With . Work with: Okidata OKI C110 C130n MC160n MFP. Color: Magenta. Item weight: 1 oz. Compatible part #: 44250714-C.
Phaser 3300 3300MFP 3300X. 1 x Reset Chip. For Printer Models. Work with: E260, E360, E460 Series. 1 x Reset Chip. Color: black. Item condition: New. (3) Printer firmware version. How you can know firmware version of your machine?. 2) Printer serial number (back of printer). THE FIX IS FOR A SINGLE PRINTER. B1160, B1160W. 1 x Reset Chip. For Printer Models. Compatible part #: 106R00861. Work for: Xerox Phaser 7500 7500N 7500DN. If (before you replace the chip) your Drum is already printing with streaks, smudges or lines, the drum is basically already defective or exhibiting signs of defect, and replacing the chip it will not bring it back to life. Compatible part #: 006R01179. Work with: Xerox WorkCentre 118 C118 M118. Product Type: Toner Chip. Page Yield: Approximate yield of 11,000 pages for each chip. Actual item is pictured. 1 Toner Reset chip @ approximate 2000 page yield. Product Type: Toner chip. Work for: Samsung ML-3310, ML-3310ND, ML-3312ND, ML-3710 ML-3710DW ML-3710ND, ML-3712DW, ML-3712ND SCX-4833, SCX-4835FR, SCX-5637, SCX-5637FR, SCX-5639FR, SCX-5739FW. Compatible part #: RF013. Work with: Dell 3110, 3110CN, 3115, 3115CN. Color: Magenta. 1 x Reset Chip. Actual item is pictured. 1 Toner Reset chip @ approximate 10,000 page yield. Product Type: Toner chip. Work for: Samsung SCX-5935, SCX-5935 MFP. Color: Black. Page Yield: Approximate 10,000 page yield. Work with: Xerox Phaser 6500, Workcentre 6505. 1 x Black Toner chip. 1 x Cyan Toner chip. 1 x Magenta Toner chip. 1 x Yellow Toner chip. Work with: Konica Minolta Bizhub C227, C287, C367. 1 x Magenta toner Chip. Color: Magenta.